SongBeamer is our software for distraction free worship. Experience the new standard for displaying songs, scripture, photos, videos, DVD to your congregation. 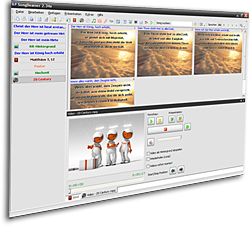 SongBeamer has been designed for speed and reliability and is so easy to use that about everybody will get started within minutes.